..it's about learning to dance in the rain. 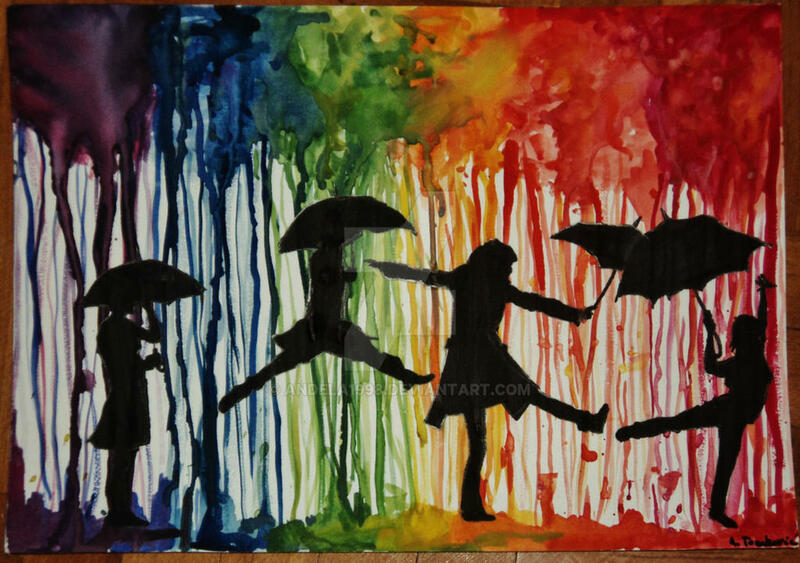 "Life's not about waiting for the storm to pass.....it's about learning to dance in the rain." done with watercolors and a black marker. Woow, I cannot believe it has over 700 s.
and i love the title also! so, both the painting AND the title i like very much! its so beautiful! wish i could do something like that... im gonna get there sooner or later though! Hello! I absolutely love this painting and the message it gives. I'm starting an inspirational art blog and I was wondering, could I post this there? haha, yeah... I was as surprised as hell that it turned out this well but later on, I've never done anything like that..
so simple, yet so wonderful.. you gave me an idea for my next painting.. Thanks I'm glad to inspire you..
Wow, its so beautiful. I can't believe that's your first watercolor! It's absolutely amazing! This is a totally great first watercolor work! The colors are amazing, as well as the poses of the person(s). I like the "clouds" and the "wet ground", the "rain", ... And once again one can see that rain can be so beautiful! Furthermore, the title says a lot, you can not always wait for better weather, just go outside and enjoy life! OMG! Love this!! Dancing in the rain is so much fun! Even though they're just silhouettes, I can tell that you are really skilled in your abilities to draw human bodies in motion. My only comment would be that some of the silhouettes are different sized, and it would create a more fluid look if you kept to a uniform size with all of them. Otherwise, awesome! Thank you very much. I'm really glad you like it I understand your point, but I actually wanted them to be differently sized because...everyone can dance in the rain (be happy). However you look like, shouldn't actually matter..nobody should judge anyone by their looks. that's the reason I painted silhouettes. Oh, so they were supposed to be different people? That makes sense! Thanks for clarifying! Bravo! Well said and very well created !!! I love it ! Thank you for the inspiration! I hope to do other works like this in the future. Well, it's great to know that I inspired someone. Beautiful colours, you are very talented! I am courious..how did you make the watercolours effect from the background? I painted the clouds first and then I put big drops all over the clouds and turned the paper vertical so the drops can slip over the paper. If this is your first then you are a genius with watercolor. This piece inspired me to try watercolor. Here's hoping it turns out. Thank you for sharing this with the world. This is such an awesome creative work! a great out look on life. u don't wait for opportunities u make them. also always look on the bright side and even the worst storms will pass faster. why thank you, and it is true i tend 2 have a way with words... my tough tends 2 give me more trouble than good. but i have learned 2 think before i talk or type and that has worked well for me. o yeah sorry i have commented on so many 2 day i kinda lost track of what i said on them all. I couldn't even tell it was taken by a camera until I read it in the description. I was too focused in the picutre. You have ALOT of veiws... cool!!! !